Interest in electric cars dates back as early as the 19th century. In 1884 inventor Thomas Parker developed and used an electric car for his commute in his hometown of Wolverhampton, and in the 1890s in New York electric taxis were used more widely than internal combustion engines. Despite this interest, cheaper fossil fuels and availability of refuelling infrastructure meant the internal combustion engine prevailed and went on to shape the 20th century. Today, new technologies are having an unprecedented impact on society – how and why we are travelling is changing. Our Future of Mobility project has been exploring the key trends, examining the latest research, and exposing insights for policy makers in order to understand how people and goods are likely to move in the future. 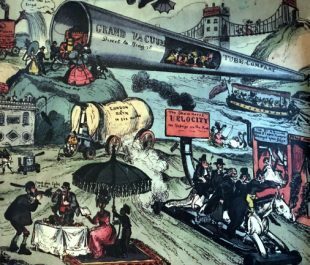 The publication of our first set of evidence reviews looks at the history of the transport system, how traditional travel by car, bus, rail and water is changing, and highlights the importance of linking the past with the future. “March of Intellect” a painting by William Heath in 1828 depicts future ideas for transport that would not be so unimaginable today. Over the coming weeks the Foresight Future of Mobility project will be publishing further material that explores our fast-changing transport system and you can access our evidence reviews here.